Background: Motivation is a theoretical construct used to explain behavior, it gives the reasons for people's action, desires, and needs, and it drives an individual to a certain action and determines human behavior. Aim: To determine the effect of motivation on oral hygiene and caries status among young adults in Hyderabad city. Settings and Design: A cross-sectional study was carried out among 18–20-year-old engineering college students of Nagole Institute of Technology and Sciences. Materials and Methods: Intrinsic motivation was evaluated using a self-reported 12-item dental intrinsic motivation scale (DIM-S). The oral examination included simplified oral hygiene index (OHI-S) and decayed, missing, filled teeth index (DMFT index). Statistical Analysis Used: Mann–Whitney U-test and ANOVA test were used for comparison among the variables included in the study. Spearman's correlation was used to correlate DIM-S with oral parameters. Results: A total of 393 students participated in the study with majority of them being male (61.8%). It was observed that 69% of the students were extrinsically motivated and only 31% of them were intrinsically motivated. However, intrinsically motivated females had a higher significant score for calculus index–simplified and OHI-S scores. All oral parameters showed a negative correlation, except decayed component and the overall DMFT. However, no statistical significance was noticed among the variables. Conclusion: The present study revealed that to motivate people successfully, one not only has to give them information but also has to pay attention to the individual reasons which restrict their behavior. Behavioral dentistry is an interdisciplinary science which needs to be learned, practiced, and reinforced in the context of clinical care and within the community oral health-care delivery systems. It helps understand inter- and intra-personal social forces that influence the patient's health behavior and activities undertaken to avoid disease. This behavior is primarily due to physical and mental factors interacting in complicated ways, and it can be analyzed by various cognitive theories.,,, The social learning theory emphasizes that the interaction between a person and his/her environment and psychosocial variables has been found reliably related to dental health behavior. It also measures the extent to which individual believes that their health is influenced by their own behavior or by external cause. Etymologically rooted in Latin word motive (to move), motivation is one of the most powerful elements in mobilizing individuals to action. Health education, in particular, relies on motivation to foster healthy behavior. Indeed, behavioral change programs that target motivation as a mediating factor are not only successful in accomplishing behavior goals but also remain consistent with the principle of individual autonomy. Motivation is a theoretical construct used to explain behavior, and it gives the reasons for people's action, desires, and needs. The motivation to fulfill basic psychological needs is held to lie at some point between perceived intrinsic and extrinsic motivation. Behaviors that are engaged in spontaneously and for their inherent interest and enjoyment are characterized as intrinsically motivated, whereas those that are engaged to please others are categorized as extrinsically motivated. In addition, intrinsic motivation has been shown to mediate the relationship between perceived control and pro-environment behaviors and contribute to increased self-regulatory efforts across behaviors. Motivation plays a major role in influencing dental health behavior. Different theories and models such as push–pull model and self-determination theory have explained the various intrinsic and extrinsic influences affecting the patient's motivation to dental care. Furthermore, Deci proposed that individuals with extrinsic motivation do not have independence in dental care but prefer “tooth extraction and emergency treatment” and brush their teeth “because of other people” and have “a diet with carbohydrates.” On the other hand, individuals with intrinsic dental motivation have characteristics of their own responsibility and “interest in taking care of their teeth to preserve them for as long as possible,” care and satisfaction “as criteria for brushing” them, and evaluation of the proper diet necessary for the sake of one's teeth. The study by Pac et al. found that patients with greater motivation had better oral hygiene. There has been very little exploration regarding the role of motivation for adherence to dental care on the oral health status.,,,,, Hence, against this background, the effect of motivation on oral hygiene and caries status among young adults in Hyderabad city was studied. Approval for the cross-sectional study was obtained from the Institutional Review Board of Panineeya Institute of Dental Sciences and Research Centre. On agreement and explanation of the study procedures, students willing to participate signed the consent form. Anonymity and confidentiality of respondents were maintained and participation was voluntary. Permission from the college was obtained before the oral examination. A convenience sample of 18–20-year-old engineering students of Nagole Institute of Technology and Science who were present on the day of examination was included. Four hundred and fifty students were approached, of which 393 students returned the questionnaire (response rate – 87.3%). Students who received antibiotic treatment within last 1 month, students with systemic medical conditions (renal disease, immunosuppression), students with active infections (dental abscess, respiratory infection), and those not willing to participate were excluded from the study. Demographic details such as age, gender, education, and past dental visit of the students were recorded. A self-reported 12-item dental intrinsic motivation scale (DIM-S) was developed by Syrjälä et al. was administered to the study students. The students were instructed to express their opinion on a dichotomous scale of score 1 (agree) and score 2 (disagree). The total score ranged from 12 to 24, in which higher scores indicated that students were intrinsically motivated. A score of 18 was regarded as cutoff with score <18 being grouped as extrinsically motivated. Clinical oral examination assessed the oral hygiene status using simplified oral hygiene index (OHI-S) by Greene and Vermillion and caries status using decayed, missing, filled teeth index (DMFT index) by Klein et al. The collected data were analyzed using the Statistical Package Social Sciences (SPSS) package version 21.0 (IBM SPSS Statistics for Windows, Versions 21.0., Armonk, NY, USA). Mann–Whitney U-test was used for comparison of the DIM-S scores with gender. 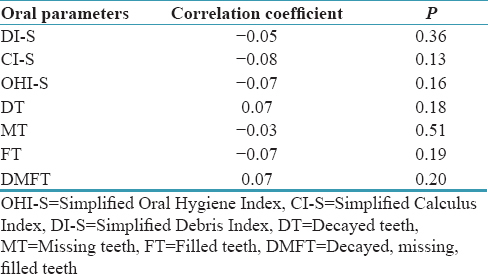 Comparison of mean scores of oral parameters (simplified debris index [DI-S], calculus index–simplified [CI-S], OHI-S, decayed teeth [DT], missed teeth, filled teeth, and DMFT) with DIM-S scores based on gender was done using ANOVA test. Spearman's correlation was used to correlate DIM-S with oral parameters. Statistical significance was set at P ≤ 0.05. The study comprised of 243 (61.8%) males and 150 (38.2%) females, with a majority of them possessing B. Tech degree (75.1%) and a mean age of 18.67 ± 0.08 years. 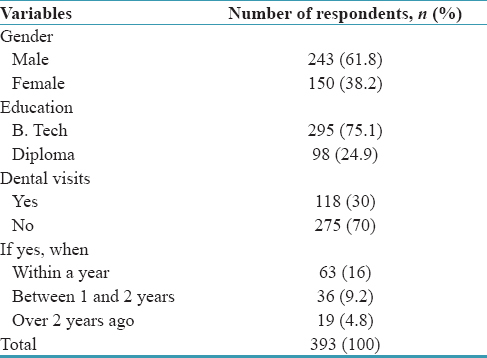 Based on dental visits, more than half of the study population (70%) never visited a dentist, and among those who visited, only 16% of the students visited in the last 1 year [Table 1]. Based on responses to DIM-S, majority of the students agreed to most of the items. However, significant gender difference was noted only for Q1 (It is not important to retain one's own teeth, because extracted teeth can be replaced by prosthesis, P = 0.02), Q7 (I brush my teeth more carefully than usual when I am going to the dentist, P < 0.001), Q10 (It gives me pleasure to brush my teeth carefully, P = 0.02), and Q11 (I watch my teeth spontaneously and contact the dentist when necessary, P < 0.001) with females agreed more than males for all items, except for Q10 [Table 2]. Among the study students, the total mean DIM-S scores were comparable among males (16.51 ± 2.05) and females (16.19 ± 2.08) (P = 0.29). When item-wise comparison of mean scores was done based on gender, a significant difference was observed for Q1 (It is not important to retain one's own teeth, because extracted teeth can be replaced by prosthesis, P = 0.02), (I brush my teeth more carefully than usual when I am going to the dentist, P < 0.001), Q10 (It gives me pleasure to brush my teeth carefully, P = 0.02), and Q11 (I watch my teeth spontaneously and contact the dentist when necessary, P < 0.001) with males showing a higher mean score for the above items, except for the item Q10 [Table 3]. It was observed that a high percentage of students were extrinsically motivated (69%) and only 31% of them were intrinsically motivated. Furthermore, similar trend was found based on gender and no significant difference was noticed (P = 0.06) [Table 4]. Based on oral hygiene, it was noted that total CI-S and total OHI-S were significantly influenced by type of motivation. Intrinsically motivated individuals had significant high overall mean OHI-S score (1.86 ± 0.79, P = 0.02) and CI-S score (1.11 ± 0.66, P = 0.002). Furthermore, intrinsically motivated females had a higher significant score for CI-S score (1.39 ± 0.76, P = 0.008) and OHI-S score (2.12 ± 0.93, P = 0.05) compared to those extrinsically motivated. However, no such significant difference was seen among males. On the other hand, type of motivation and gender did not impact DI-S scores. 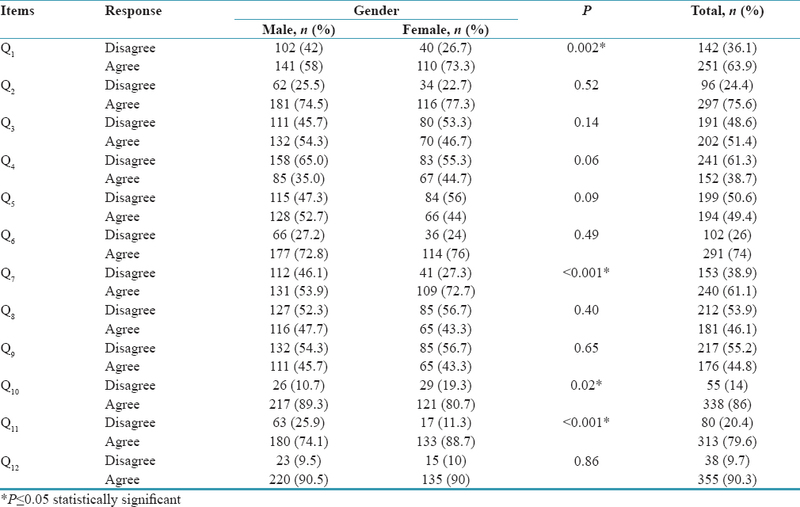 Likewise, the DMFT scores and individual component of DMFT were not affected by type of motivation based on gender with comparable scores in both categories [Table 5]. When correlation between oral parameters and DIM-S was carried out, only DT component and overall DMFT scores revealed a positive correlation, whereas all other oral parameters had negative correlation. However, no statistical significance was noticed among the variables [Table 6]. Dental diseases are highly preventable and largely dependent on the healthy oral behaviors. Among common oral diseases, dental caries is one of the most common oral pathologies, which remains widely prevalent and affects all population throughout the life. Dental health-care professionals recommend regular oral self-care behaviors for plaque removal as bacterial plaque plays an important role in the etiology of caries, gingivitis, and periodontal diseases. At present, obtaining the patient's interest, motivation, and cooperation to practice and maintain good oral hygiene is one of the most difficult problems because of scheduled lifestyles, deleterious habits, and hectic workload. An effective dual-approach involving periodic professional teeth cleaning and performing daily dental home care not only requires effective oral hygiene instructions by professionals but also patients to be motivated to carry out these important behaviors. Gao et al. studied the effect of motivation in improving oral health through a systematic review and found that oral health outcomes were positively affected by motivation. A growing body of evidence, showed that the intrinsic motivation is more likely to predict behavior change than extrinsic motivation. Hence, to objectively measure motivation, Syrjälä et al. developed DIM-S to determine whether or not individuals will take responsibility for their own health. In the present study, the population chosen was engineering students aged 18–20 years. This age is a crucial period as personal responsibility for preventing dental disease begins at this age and determines future oral health. However, with a higher education background, the concept of prevention and well-being could be more easily understood by the students, along with proper utilization of the dental-care services. Hence, the assessment of oral health awareness and dentition status of young adults becomes more essential. The only available instrument which measures the intrinsic motivation in dental care is DIM-S developed by Syrjälä et al. This questionnaire measures the intrinsic motivation in dental care in a homogeneous manner with good internal consistency and standardized item alpha being 0.69. The present study comprised 393 students, of which 243 (61.8%) males and 150 (38.2%) females aged 18–20 years. Similarly, a study conducted by Anuradha and Sinha among engineering students on dentition status and treatment needs in Lucknow, Uttar Pradesh, noted that 71.1% were male and 28.9% were female aged 19–25 years. In the current study, majority of the students (70%) never visited a dentist, and among those, only 16% of the students visited within the last 1 year. In contrast, a study by Fotedar et al. et al. among Shimla population reported that 52.3% visited dentist >2 years ago and 46% visited dentist regularly. Likewise, Schuurs et al. found that regular attendance gives a higher priority to retention of their teeth than do irregular attenders. This reflects a need to increase awareness through oral health education programs and reinforcement of more positive attitude toward oral health. The existing study revealed that both males and females had a comparable mean score with respect to the most of the items of DIM-S. However, a significantly high percentage of females agreed that it is not important to retain one's own teeth (Q1), brush their teeth more carefully when going to dentist than usual (Q7), and I watch my teeth spontaneously and contact dentist when necessary (Q11) and disagreed that brushing their teeth carefully gives them pleasure (Q10). This could be because individuals are more likely to perform behaviors they perceived as controllable and might be particularly powerful when individuals had a strong intrinsic motivation to perform the behavior. Furthermore, Syrjälä et al. among Oulu population reported that extrinsic motivation was greater among those who mentioned the purposelessness of brushing their teeth, lack of time, lack of interest, laziness, and failure to appreciate the seriousness of dental care. In this study, it was observed that most of the students were extrinsically motivated (69%) and students motivated intrinsically were only 31%. On the contrary, among Oulu population, many of the students were intrinsically oriented. However, in the present study, higher percentages of males were extrinsically motivated when compared to females. This could be due to the fact that males were less self-determining and competent about health behavior. Hence, the perception of independence and their far-reaching ideas on preserving their teeth form a good basis for further dental instruction. In the present study, CI-S and OHI-S were significantly influenced by type of motivation. However, intrinsically motivated females had a higher significant score for CI-S and OHI-S, indicating that most of the extrinsically motivated persons seemed to propose superficial reasons and relate to nonappreciation of dental care more often than intrinsically motivated. A strong negative correlation was noticed between DIM-S, oral hygiene status, and caries status, except for DT and DMFT components. It was assumed that people are influenced by powerful others externality which may increase the dependence on health professionals for their health maintenance and it may be reflected as poorer oral hygiene behavior. However, a study done by Syrjälä et al. showed that positive feedback should be used more often in a dental context to increase intrinsic motivation. Hence, it is necessary to motivate through appropriate oral health education programs, and it further helps to adapt and endure health-promoting lifestyles and practices among the young adults. The present study acknowledges certain limitations such as the cross-sectional nature of the study which was confined to engineering students of single institute; hence, the results should be generalized with caution. The effects of age, gender, and education in the etiology and motivation in dental care could not be clearly established. Finally, there was a lack of correlation between DIM-S and caries status. The present study states that to motivate people successfully, one not only has to give them information but also has to pay attention to the individual reasons which restrict their behavior. Based on the present study, it can be concluded that both intrinsic and extrinsic motivation plays an important role in determining oral health. We would like to thank the administration of Nagole Institute of Technology and Science for giving permission to carry out the study. Tandon S. Text Book of Pedodontics. 2nd ed. Hyderabad: Paras Medical Publisher; 2009. p. 142-8. Bandura A. Social Learning Theory. Emgle-Wood Cliffs, NJ: Prentice-Hall; 1977. Ajzen J, Fishbein M. Understanding Attitudes and Predicting Social Behaviour. Englewood Cliffs, NJ: Prentice-Hall; 1980. Weiner B. An attributional theory of achievement motivation and emotion. Psychol Rev 1985;92:548-73. Syrjälä AM, Knuuttila ML, Syrjälä LK. Intrinsic motivation in dental care. Community Dent Oral Epidemiol 1992;20:333-7. Conner M, Norman P. Predicting Health Behaviour. Buckingham, UK: Open University Press; 1996. Ajzen I. The theory of planned behavior. Organ Behav Hum Decis Process 1991;50:179-211. Rogers RW, Prentice-Dunn S. Protection motivation theory. In: Gochman DS, editor. Handbook of Health Behavior Research I: Personal and Social Determinants. New York: Plenum Press; 1997. p. 113-32. Schwarzer R, Fuchs R. Self-efficacy and health behaviors. In: Conner M, Norman P, editors. Predicting Health Behavior: Research and Practice with Social Cognition Models. Buckingham, England: Open University Press; 1996. p. 163-96. Dunsmore S, Goodson P. Motivation for healthy behaviour: A review of health promotion research. Am J Health Behav 2006;37:170-81. Staunton L, Gellert P, Knittle K, Sniehotta FF. Perceived control and intrinsic vs. extrinsic motivation for oral self-care: A full factorial experimental test of theory-based persuasive messages. Ann Behav Med 2015;49:258-68. Nagarajan S, Reddy C, Chandra RV. Motivation in periodontal therapy: Assessment using novel dental treatment motivation scale (DTMS). Dentistry 2014;4:268. Syrjälä AM, Knuuttila ML, Syrjälä LK. Obstacles to regular dental care related to extrinsic and intrinsic motivation. Community Dent Oral Epidemiol 1994;22:269-72. Pac A, Oruba Z, Olszewska-Czyż I, Chomyszyn-Gajewska M. The significance of motivation in periodontal treatment: Validity and reliability of the motivation assessment scale among patients undergoing periodontal treatment. Community Dent Health 2014;31:53-6. Halvari AE, Halvari H. Motivational predictors of change in oral health: An experimental test of self-determination theory. Motiv Emot 2006;30:295-306. Syrjälä AM, Knuuttila ML, Syrjälä LK. Reasons preventing regular dental care. Community Dent Oral Epidemiol 1992;20:10-4. Anuradha P, Sinha PM. Dentition status and treatment need of engineering college students in the city of Lucknow, Uttar Pradesh. J Indian Assoc Public Health Dent 2011;18:148-53. Nandhini L, Barani K, Prabu D, Manipal S, Ahamed A, Adusumilli P. Self-reported barriers to regular dental care in Chennai, Tamil Nadu. J Orofac Res 2013;3:161-5. Agarwal M, Agarwal S, Anuradha P, Dutta SD, Sharma A, Gupta M, et al. Dentition status and treatment need of engineering college students in Lucknow. J Indian Assoc Public Health Dent 2014;12:272-5. Ahmadi-Motamayel F, Seif N, Mortazavi H. Comparison of tooth caries status between medical and non -medical students in Hamadan, Iran. J Isfahan Dent Sch 2013;8:637-44. Klein HT, Palmer CE, Knutson JW. Studies on dental caries I dental status and dental needs of alimentary school children. Public Health Rep 1938;53:751-65. Gao X, Lo EC, Kot SC, Chan KC. Motivational interviewing in improving oral health: A systematic review of randomized controlled trials. J Periodontol 2014;85:426-37. Hurkmans EJ, Maes S, de Gucht V, Knittle K, Peeters AJ, Ronday HK, et al. Motivation as a determinant of physical activity in patients with rheumatoid arthritis. Arthritis Care Res (Hoboken) 2010;62:371-7. Mata J, Silva MN, Vieira PN, Carraça EV, Andrade AM, Coutinho SR, et al. Motivational “spill-over” during weight control: Increased self-determination and exercise intrinsic motivation predict eating self-regulation. Health Psychol 2009;28:709-16. Schuurs AH, Duivenvoorden HJ, Thoden van Velzen SK, Verhage F. Regularity of dental attendance in the Netherlands related to preference for preservation of teeth. Community Dent Oral Epidemiol 1984;12:249-54.